The Golden State Warriors are looking for their 13th straight win and they travel to Minnesota to take on the Timberwolves. While the T-Wolves are not a very good team, they are young and fun to watch. They can be dangerous, especially at home. 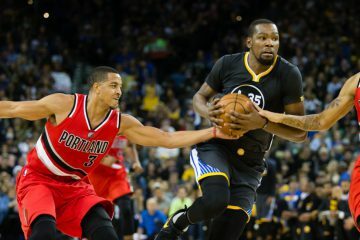 However, as long as the Warriors play their brand of basketball, they should be able to get the win on the road. Steph Curry gets things started with a steal and a bucket on the other end, they quickly grabbed the league. Andrew Bogut exited the game in the first couple of minutes and had his knee looked at. Festus Ezeli checked into the game and Bogut went to the locker room. After the Aussie went out of the game, the Warriors went cold and could not find the bucket. The Warriors were getting good looks, but couldn’t convert. 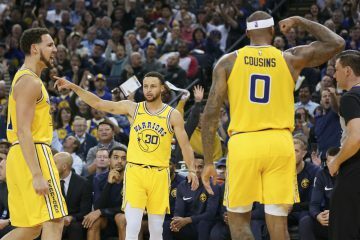 It took some time for the Warriors to find a rhythm, but they finally did and were able to build a small five point lead. The Splash Brothers combined for 15 points and the Warriors only hit one three in the quarter. No other starters scored, but the Warriors took a 25-20 lead into the second quarter. Both teams looked much better offensively and the game became more enjoyable to watch. The second unit played well and were able to maintain lead. When some of the starters checked in, they started hitting some shots, but the T-Wolves were relentless. 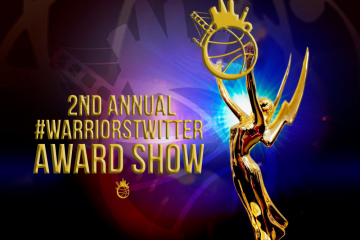 They stayed within striking distance and the Warriors could not get any separation. Minnesota cut the lead to 2 points at the halfway point. For the next three minutes the Warriors turned it on, and the Wolves went cold. The Dubs took a nine point lead into halftime, but their concern is with their big man Andrew Bogut, who didn’t return. Corey Brewer came out firing in the second half. He put up five points in the first two minutes, but the Warriors looked good as well. The Splash Brothers were both effective and hit a couple of shots. 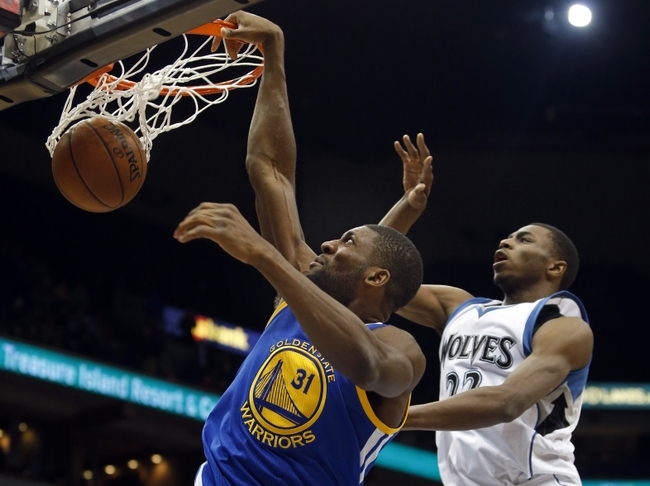 The Warriors increased their lead to 10 points, but Thaddeus Young got into the mix with six quick points. The Wolves again within six points, but could not closer than that. The Warriors turn it on so quickly and they know how to put the ball in the basket. Curry knocks down a three and just like that, the Warriors were up 13. Might be the most boring Warriors game of the season. Not the most entertaining game, but in a span of an 82 game season, this is bound to happen. The Warriors carried a 12 point lead into the final period and they kept adding to it. Justin Holiday checked in the game early in the quarter and he got on the board with a three point bucket. Steph Curry knocked down a few shots a piece and they increased their lead to 22. 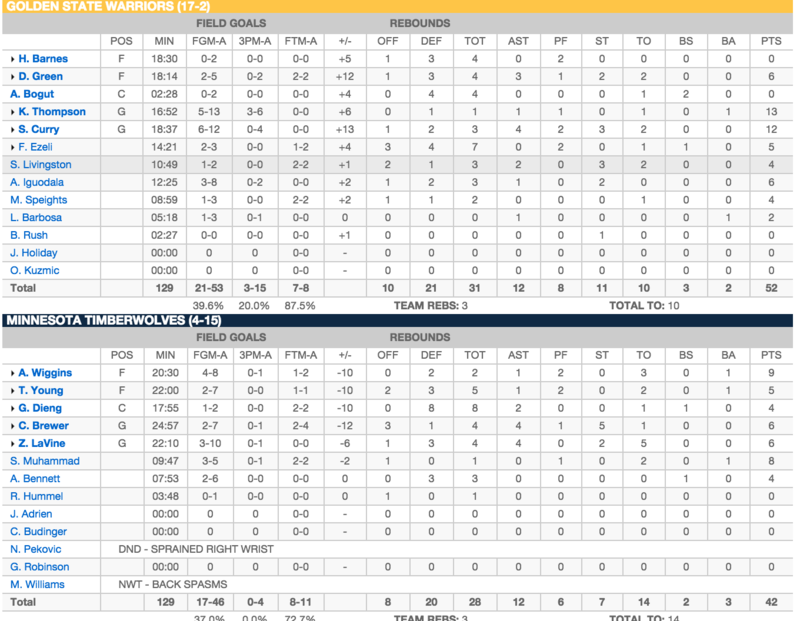 Kerr put in the rest of his bench and the Warriors were able to hold of the young Wolves. Warriors win 102-86. 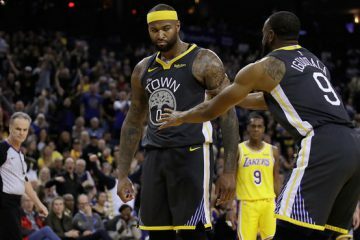 Writers Roundtable: Was Joe Lacob Wrong?